Preface. Analysis of Combined Mismatched Tooth Surfaces Up To and Including Third Order Contact. Introduction. Establishment of moving frames. Differential forms of moving frames. Restricting conditions for contact. Second order contact analysis. Third order contact analysis. Example calculation. Conclusion. A Direct Method for Calculating Geometric Parameters of Tooth Surfaces Up To and Including Third Order. Introduction. The curvature tensor of a surface. Geometric parameters of the generating flank. Second order geometric parameters. Third order geometric parameters. Example calculation. Conclusion. Analysis of Rates of Change of Contact Situations of a Gear Pair under Vertical (V) and Horizontal (H) Check. Introduction. The longitudinal direction and geodetic curvature of longitudinal line. The rates of movement in V and H directions. The rates of change of the second order contact situations. Example calculation and experimental results. Conclusion. A Direct Method for Determining the Parameters of Mating Tooth Surfaces according to Predetermined Contact Situations. Introduction. The basic formulae of point-contact tooth surfaces. Situation of predetermining contact parameters on known surface. Situation of predetermining contact parameters on unknown surface. Example calculation. Conclusion. A Simple Method of Obtaining Machine-Setting Parameters for Spiral Bevel and Hypoid Gears. Introduction. The machine root angle and forming position of reference point. The difference surface and generating flank. Machine setting parameters for generators with neither modified-roll nor workhead-vertical-feed mechanism. Machine setting parameters for generators with modified-roll mechanism. Machine setting parameters for allcone method. Example calculation. Conclusion. An Optical Synthesis of Spiral Bevel and Hypoid Gears. Introduction. The reference point on generating and gear tooth flank. The objective function for optimal synthesis. Optimal synthesis process. Reasonable presetting of contact parameters. Conclusion. Analysis of Error Sensitivity of the Contact Situations with Respect to Mounting Errors. Introduction. Mounting error vector of a gear pair. Error sensitivity matrix of the position of tooth bearing centre. Error sensitivity matrix of second-order contact parameters. The background of application. The relationship between error sensitivity matrices and vertical (V) and horizontal (H) check results. Numerical example. Conclusions. References. Appendices. Subroutines. Main program for machines with cutter-tilt mechanism. Main program for machines with modified-roll mechanism. Numerical example. User's guide for appendices 2 and 3. 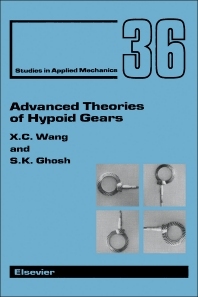 In order to develop more efficient types of gears, further investigation into the theories of engagement is necessary. Up until now most of the research work on the theories of engagement has been carried out separately on different groups, and based on individual types of profiles. This book aims at developing some universal theories, which can not only be used for all types of gears, but can also be utilized in other fields such as sculptured surfaces. The book has four characteristics: the investigations are concentrated on mismatched tooth surfaces; all the problems are dealt with from a differential geometry point of view; most theories and algorithms are universal in application; and the algorithms are easy to follow and can be used in real situations. In the process of developing the algorithms, the authors have introduced some mathematical methods which are believed to be innovative with regard to the theories of engagement known so far. A theoretical treatment is presented throughout the book, supported by numerical examples and experiments. With the computer programs listed at the end of the volume, any of the proposed methods can be easily utilized in practice. The book is intended for postgraduate students, lecturers, professors, or research staff in mechanical/manufacturing engineering, mathematics and R & D departments of research institutes and universities. It will also be useful for engineers working in the gear manufacturing sector of industry.